Every week, the Patent Office issues new patents covering aspects of trading cards and sports. I don't write about a lot of these because most 1) are overly complicated, 2) only tangentially involve the trading card/sports memorabilia industries or (the most common problem) 3) are boring. They have title like: "Friends list management ," "System and method for producing custom merchandise from a virtual environment ," and "System and method for inter-connectable multi-track media-based trading cards." My favorite, obviously, is "Printing structure of medium surface on which dot pattern is formed by printing, printing method, and its reading method." Yeah, with titles like that, you can see why I don't write too much about new patents. The only exception is if the patents get litigated. Then, and only then, will I give an in-depth analysis. After, of course, imbibing on a lot of caffeine and chocolate to stay awake. Every once in a while, like this time, a patent issues that can be summarized easily…like…by showing you the figures. I love these patents because who doesn’t like to look at pictures? Allow me to introduce you to U.S. Patent No. 8,458,933, which issued on June 11, 2013, to George Tahan. 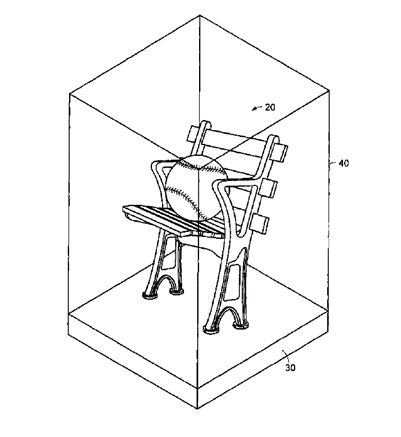 The patent is entitled "Sports Memorabilia Display" and claims, well, I think Figure 1 speaks for itself. Yep. It's a chair for your memorabilia. The perfect gift for couch potatoes who would like their favorite piece of memorabilia to sit next to them -- in its own chair, of course. And because it is patented, don't run to your garage and make your own chair for your memorabilia. If you do, you're just asking to be named as a defendant in a patent infringement lawsuit. Then I'd have to write about you and provide an in-depth analysis of this patent. Oh, jeez. Let's hope that never happens. ULTRA PRO UV BASEBALL CUBE BALL HOLDER DISPLAY CASE CRADLE NEW SEALED!